YES: First and foremost, the bag is adorable, I am personally content just looking at the bag! The lining keeps food cool or warm depending on how it was recently prepared. The zip is strong -enough that you stuff this bag with 'tall' foods like an apple and still be able to zip with ease. The cavity is deep and holds enough grub for a kid sized appetite. 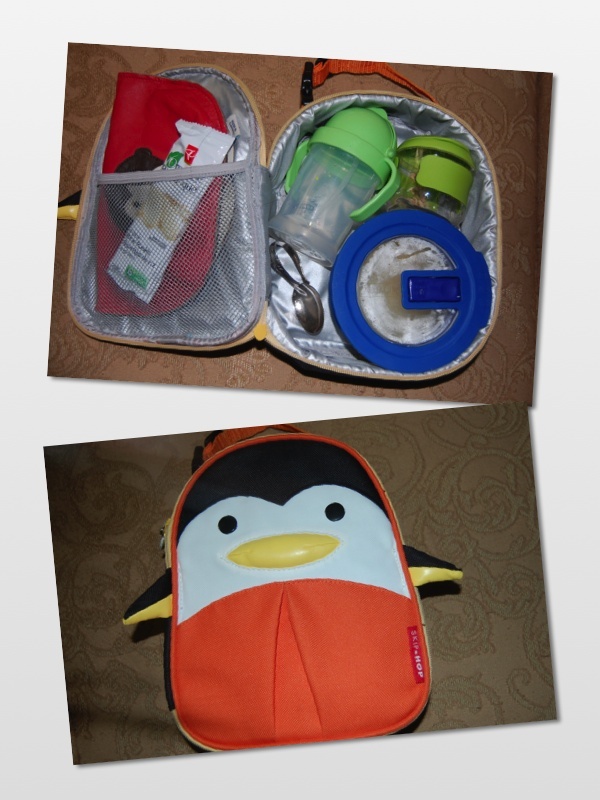 The bag is nicely compact and can easily be stuffed in my stroller undercarriage without taking up too much room, or even hang from the 'mommy hook' without being too cumbersome. NO: What im not loving about this bag though is that the placement of foods isn't oriented vertically but instead, horizontally. I had to buy leak proof glassware in case Max's food involved soups/liquids as when placed in the lunch bag, the food is lying down. To tote, the bag has to be upright and the food is then tilted on its side just asking for a leaking mess! I highly recommend purchasing leak resistant containers, or better yet, pack a sandwich! I have two sets of spoons that i've been feeding Max with, standard baby spoons and this curved silver spoon. YES: At first I wasn't fond of the design of this silver spoon because I just wasnt seeing it as very ergonomic compared to the standard long handled utensil, but as Max got bigger (and mouth and appetite got bigger), this curved spoon has become the perfect shovel for the near bottomless pit. My index and middle finger and thumb work in unison to allow me to feed Max with ease. I can scoop plenty of food, no inkling of cramping or awkwardness in the hand, the spoon is light, it's very ergonomic and fitting for my feeding style and positions sometimes necessary to do so. I like that i can feed with my left and right hand, and both techniques are comfortable with this spoon style. 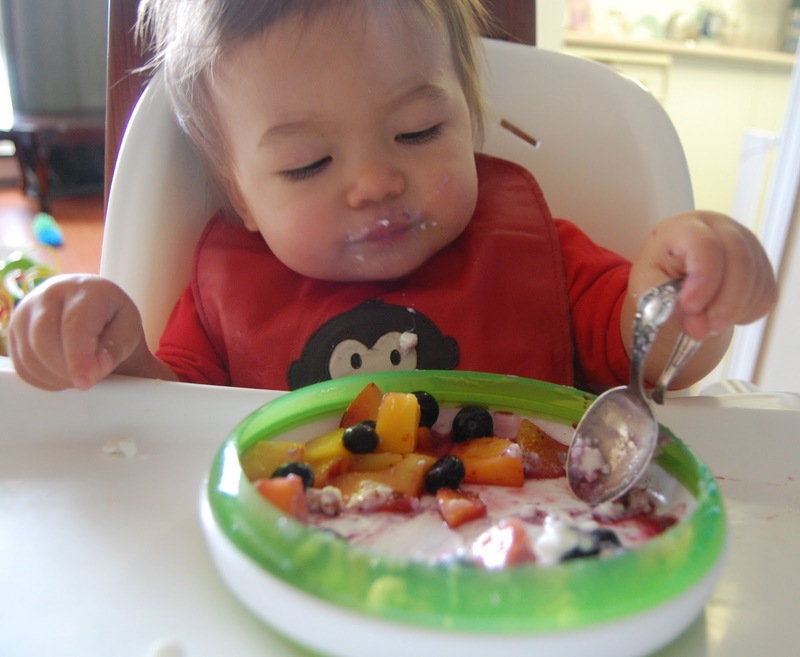 The spoon is compact in size, the scoop is akin to a teaspoon in quantity and not at all too big for Max's baby mouth. this will be a nice heirloom and the silver will last the test of time. My favourite baby feeding utensil! NO: what i dont like about this spoon is merely personal preference- it oxidizes (naturally). so if you want a shiny utensil you have to use silvo to wipe of the black. when it comes to Max's health vs. a shiny spoon, Max wins. 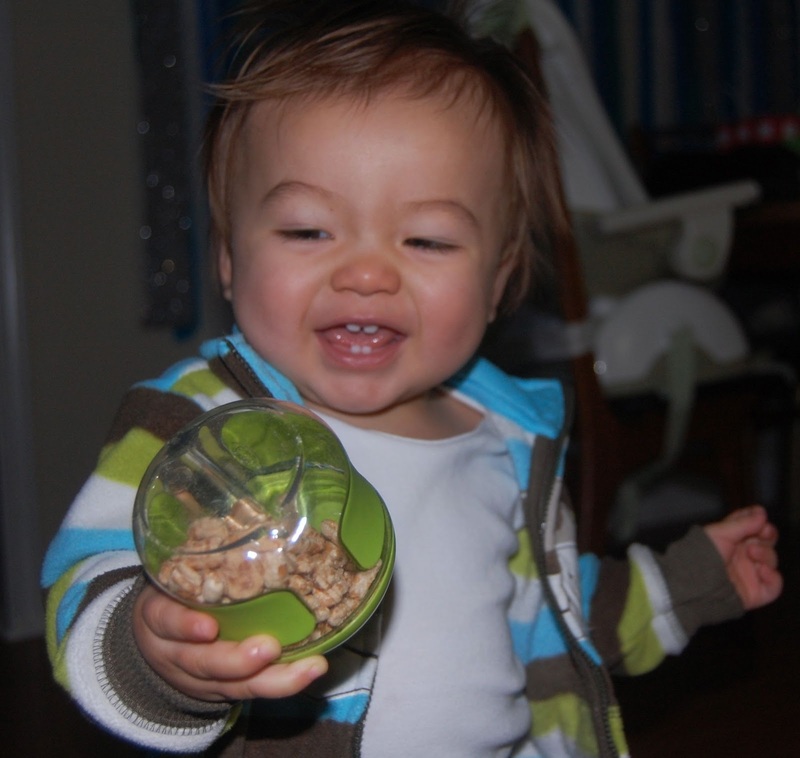 This OXO tot plate has been perfect for the little man who is now feeding himself more efficiently. YES: It's a nice size that fits plenty of food. I like that it's not divided because grownup plates aren't divided and Max should learn from the beginning that the world won't end if different foods touch each other! Although not slip proof, it has a slip resistant weighted bottom which makes life easier for Max when he's trying to pick up food or even use a spoon, and the plate isn't moving around all over the tray. It's sturdy- it at least provides some obstacle (albeit minimal) when the little one feels like using this as a frisbee instead of a plate (which he surprisingly has not as the shape doesnt have any overhangs for picking up)! What i love most about it is the removable green ring that acts as a lip- it actually helps Max keep the food on his plate. 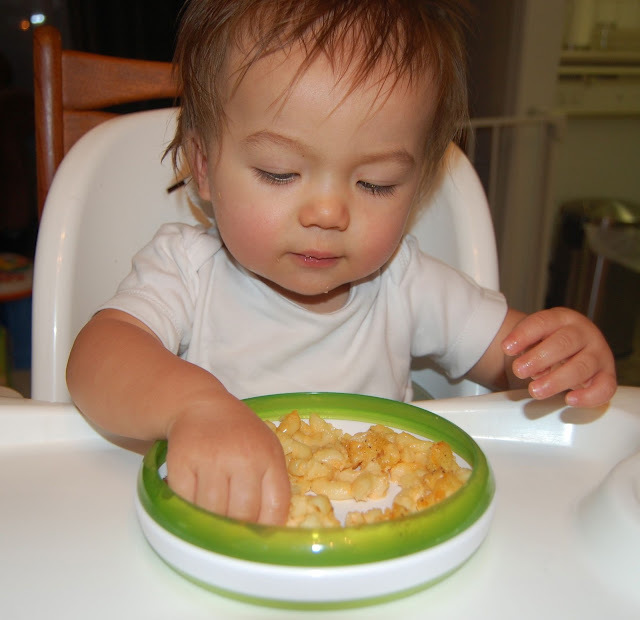 The concave angle pushes the food back onto the spoon and when using his hands, aids Max in keeping the food on his fingers instead of the high chair tray (80% kept on plate, 20% on tray). Easy to clean, no BPA, dishwasher safe, microwaveable, and bonus marks for being attractive! 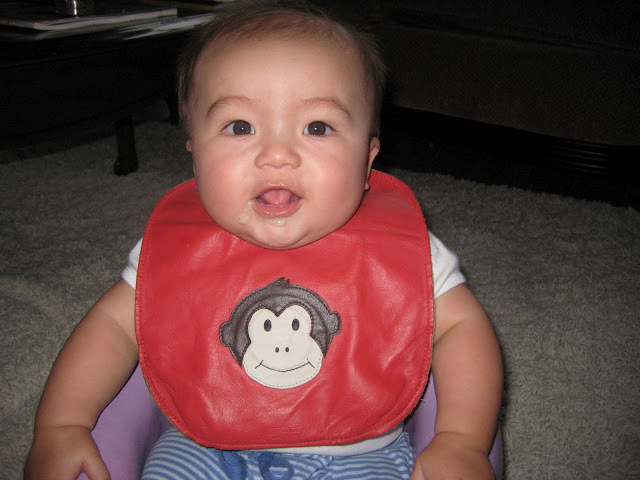 This Mally Bib has been with Max since our food journey started. YES: It's the ultimate in practicality as food + baby = messy, and nothing beats just easily washing a bib with soap and water, let air dry, and use again for the next meal. The bib is made of leather and has a strong magnetic snap behind the neck that can easily be pulled off by a parent but not so easy for a child (been there!). Furthermore, the magnetic snap is great for sticking on the fridge when done with- no more looking around for another bib! it is easily foldable and thus yet another item we tote around in Max's lunchbag. The bib comes in two sizes, one for babies and another for toddlers. at 1 year old of average weight and height, his baby sized bib still has plenty of room before I need to move up to the next level. Bonus points for the bib being reversible! the other side of THIS particular design is a beige and light brown combination with a pocket that probably serves the purpose of catching foods that don't make it into the mouth. NO: What i dont like about it being leather is that it is starting to smell like an old dish cloth. Have i washed it too many times? Does it need a good roast under the sun to burn the smell off? Fortunately, the smell isnt overpowering enough to affect Max's appetite. nevertheless, ive been using the reverse side with pocket just to deter potential appetite busters. Also, im not loving the retail price for this bib, approximately $37! I guess if you count the number of bibs you need to buy and launder, plus the energy costs it takes to launder, this justifies the price...but i still say OUCH! I used to carry Max's dry snacks in a ziploc bag, but the crunchies created holes in the ziploc bags from our wear and tear and thus needed to be replaced almost weekly (not very ecofriendly i know). This reusable snack cup has been our contribution to the environment for toting around dry snacks. YES: it is small in size, holds enough food for a toddler's appetite, fits perfectly in little hands, the opening is perfect for little hands to pull food out, and thus yet another item always carried in Max's lunch bag. The sides have a grip-rubbery texture to it (similar to the base of the OXO plate) so when Max is running around, it isn't flying off of his hands. 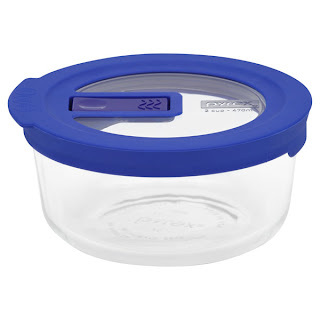 I love that the open/close lid is not only a learning opportunity, but is attached (and removeable if need be) so i dont need to go looking for lost lids in my kitchen or wherever it was dropped in public spaces. Currently, Max is still in the process of learning how to open the lid, but is quite content with it closed as he uses it as a rattle until he notices what's making the sound- and then he wants it opened. This 'rattle' also has its downside though as Max doesnt yet know that a closed lid will keep contents inside, so i'll let you figure out what happens next (supervise your kids)! NO: The lid is not air tight. Though great for little learners as it won't snap on fingers, it also does not keep whatever is inside fresh for more than 24 hours. i'm in the habit of clearing Max's lunch bag every night and if there's crunchies left inside the snack cup, i just put the entire cup in a ziploc bag and take it out again for the next meal. Yes it's another ziploc bag, but it gets near infinite use. if dropped (read thrown) on the ground, the lid will not always stay closed, potential mess. What I wish this snack cup had was a ring so i can attach it to the stroller or shopping cart with stroller links and Max can feed himself. But with such a wide opening, i think it's best that a parent hold it anyways to prevent big spills! I've been using this snack cup for the stroller as evidenced by the attached stroller rings. It took a couple of days for Max to figure out to put his hand in and then out, but now all is well. YES: I like the fact that if Max needs an extra snack, i just empty out the snack disk or snack cup in this and let him feed himself while on the stroller or even while sitting on a shopping cart! Anything that promotes hands-free parenting and kids-learning-for-themselves, is a must try in my book! The lid snaps on easily and i've had no problem with it falling off when Max is using this as yet another rattle. The lid wings are spill resistant (not spill proof)- yes, even some mild shaking will result in some fallen Nutrios, but not as much as if it were a wide open mouth. NO: Of course, as the lid has slits, it will not keep crunchies fresh, so it is best to empty out into an air tight container at the end of the day or they'll get very stale by the morning. I'm not sure if it's the lid design or just the way Max grabs food but when he pulls food out, it's like extra crunchies pop out from the cup or from the pile he grabbed. Either a technique thing on his part or that the flexible rings are just a little tough to pull his hand through easily. Learning process. Setting the breast aside, Max's second form of acquiring liquids has been this ZOLI bot cup. It took about a week for him to figure out how to use it but afterwards, he's been loving this cup! YES: The two 'arms' of the cup allows for Max to hold onto this cup on his own easily and shake it around like a rattle with ease. The lid has an attached cover for the straw when not in use- just slide on/slide off, nothing is lost after a washing, and the straw isn't contaminated when not in use. There is a valve system with the straw so that if turned on its side, liquid is not pouring out. The valve is also weighted and moves around based on Max's orientation, so wherever the liquid is located Max is able to get a drink. Honestly, I think there's something about the straw that has him preferring this cup over other straw cups. 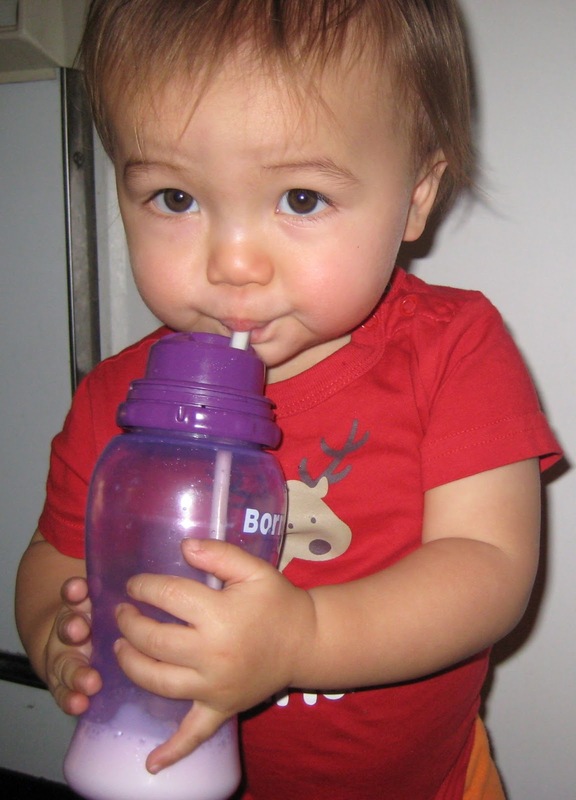 He just rejects 98% of straw cups unless the straw is as thin and as soft/flexible (read durable teething toy). NO: What I don't like about this cup though is that it is pricey! Also, i think it's imperative to buy the ZOLI replacement/cleaning kit (more expenses) as that pipe cleaner/cleaning brush is needed to clean inside the straw. Max only drinks water from this cup but i see black particles (God forbid it's related to mold) inside the straw so i have to clean it weekly. Is it mold? Is it dirt? I dont know what it is but it's cleaned/brushed through under running water until visibly clean. i've also noticed a few times that whenever i have flicked open the lid, i get sprayed with water. again, sometimes it happens, sometimes it doesnt, but im just glad it's water for now. YES: Well my friends, it hasn't leaked liquids even when toted around in Max's aforementioned lunch bag! Microwave and dishwasher safe, no stains or smells, moderately heavy but as expected for glassware. I like that for cleaning, it's easy to separate the lid from the rubber ring that keeps it a 'no-leak' product. It's also nice to have that vent on the lid for microwaving so if your food splatters, it's not all over inside the microwave. i tend to just remove the lid altogether and cover the food with a paper towel so im not microwaving plastic, personal preference. NO: What I am not loving is that whenever i open the lid the ring partially separates from the lid. Not sure why. Not a huge deal for dry food but when packing wet food there's just a bit of a mess all over the lid that needs to be scraped off from the two parts. This snack disk has been a useful snack reservoir for my snacks, but has also been used for Max's crunchies. YES: i love that the lid is air tight and keeps our food fresh! its been real handy lately to have some extra snacks as Max's meals just seem to go right through him (it's nice to have options for him too). carrying extra snacks has also become a bit of a gimmick we use to keep him busy and still in the high chair at restaurants so we can eat in peace! It's compact, has a slip resistant bottom for when Max eats out of it, and the spaceship like shape to it is designed to aid in containment in case of a spill (again, spill resistant not spill proof)! bonus points for lid staying in place whenever this has been thrown/dropped/slipped onto the floor! for my personal use, it's been handy to carry snacks from the bulk section. i think it carries up to about a cup/250mls worth of food. i dont always find it necessary to snack, but great for relieving transit related nausea. i used to keep my purse snacks in a ziploc bag or tupperware but this is so much better in appearance, durability, and size. easy to clean inside and outside. dishwasher safe, no BPA. NO: With the diameter of this snack disk being fairly wide, it doesn't really fit into Max's lunch bag along with everything else i want to take so this is kept in my purse or backpack as a just-in-case source. also, i wish this product had a ring so i can attach it to a bar and give Max the opportunity to feed himself. the lid is also separate and not attached, it has the potential to be lost. I use this straw cup for Max's non-water beverages, which at his age is really just whole milk. It's appropriate for ages 18 months+ hence the general large size of the container. 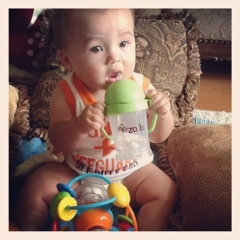 This is the ONLY straw cup next to his Zoli that Max will use! YES: the only 2 things i love about this cup is that it is super easy to take apart and clean- even the straw connection. I have not noticed any residue in the straw like i have with the Zoli cup, probably because soap can flow through the straw when washed! NO: What i don't like about this cup is that there are no arms for Max to hold onto it more effectively. There also is no valve at the end of the straw so sometimes if i'm not paying attention, Max is trying to drink but no fluids are coming up until i tilt or turn the cup in a functional angle/position. There is also a crappy transparent lid that comes with this cup, it turns clockwise/counter clockwise to tuck in the straw when not in use, it isnt attached so losing it is possibility. After Max drinks from this and has milk still in the tubing, if he shakes this cup- milk is flying, if left unattended on the ground after he drops it- milk is leaking on the ground from the straw opening (no valve), and if i turn the 'lid' to hide the straw, milk will be leaking from the cup (i dont know why). Most annoying of all, sometimes milk is just erupting out of the straw as if a ghost was sucking on it (yes, while upright and untouched) it creates such a mess and wastes expensive milk! Finally, Max loves chewing on the straw every now and then, and there are no replacement kits. I'd have to buy a new cup once the straw has broken down. Oh Max you are just so cute! We love our Mally bibs and our Oxo stuff too. Since I invested in a few quality pieces with Ben, I was able to use all of them with baby #2. Save! Save! Is your mallybib starting to smell? No! We have 1 from Ben's baby days and 1 that is about 6 months old. I've just washed them with soap and water and hung them out to dry. They've permanently hung on the side of the refrigerator between uses. I haven't noticed a smell. Now, I'm off to do some sniffing haha!